Usually my love in biryanis is limited to non-vegetarian dishes. I mostly use chicken and fish for preparing flavorful, mouth watering biryanis. I had prepared this biryani for my vegetarian friends and they loved it!! That was the time I did not use to document my recipes so did not take any pictures. Using the same picture from my Malabar Dum Chicken Biryani. This biryani recipe is for all the vegetarian friends who love to enjoy biryani in their own ways. Heat ghee and cooking oil and fry the onions on medium heat until they become fried, brown and crispy. Drain the oil and keep aside. Next, fry the cashews and raisins in the same pan and drain and keep aside. Wash and keep the rice aside. Keep a pan (for the rice) on another stove and heat ghee. Add the drained rice and fry for about 2 minutes. Add water (2 cups) and add the whole spices: cardamom (seeds), cinnamon and cloves. Add the lemon juice, mix and let rice cook and when it is done, turn off the heat and cover it and let it sit. Warm the milk in microwave for about 30 seconds and add the saffron strands to it. Keep aside. By this time we will prepare the vegetables. Cut the cauliflower into florets and boil in salted water till they are slightly cooked and a little soft. Chop the potatoes and fry them a bit in the same oil and ghee mix in which the onions were fried. Drain from the oil and remove the fried potatoes. Sprinkle garam masala on the potatoes. Fry the carrots in the same way as the potatoes or both could be fried together. Carrots can be chopped either in rounds or slit length-wise. Keep all the vegetables aside. Vegetables can also be boiled but I prefer to fry them for a bit so they taste better. Heat the same pan and add 2 tsp. oil. Add the chopped tomatoes and let cook on medium heat till they soften. Then add ginger, garlic, green chillis and mix well. Add the fried vegetables and peas, salt and the chopped mint leaves. Mix everything well and let cook for about 2 minutes until everything is mixed and absorbed well. Add biryani masala (or garam masala) and lemon juice. Give a quick stir and turn off the flame. Now start making layers: In a heavy bottomed deep pan, begin by adding the ghee. Then add half the cooked vegetable masala. Now add half the rice in another layer above it. 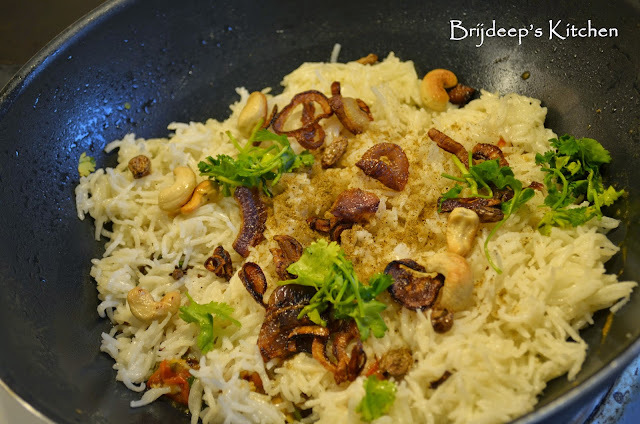 Sprinkle little garam masala, spread half of the fried onions and half of the cashews and raisins. Add the remaining cooked vegetable masala in a layer above the rice layer. Add the remaining rice on the top layer. Add the other half of onions and the remaining cashews and raisins. Add the saffron milk to the pan and cover with a lid. Now knead the dough as you would for chappati and tightly cover the edges of the cover on the pan with it so it gets sealed and no air can escape. You can also cover with a lid and place a heavy weight on the lid and it works the same as dum ! Keep this pan with cover on the lowest heat for about 10 minutes and let cook. This is so that the rice and the masala gets fused in together. Don't keep it for long time as the veggies are already cooked so they might become mushy. Remove the seal, open the cover and garnish with coriander leaves. Serve hot ! !